As a Church we want to see people serve together, to be on mission together. Leaders need to prepare or equip people (Eph. 4:11-12) which not only involves training on the specific ministry they’ll be doing but also helping them learn to work as a team. We’ve been using Philippians 2 for some Essential Team Building Components. 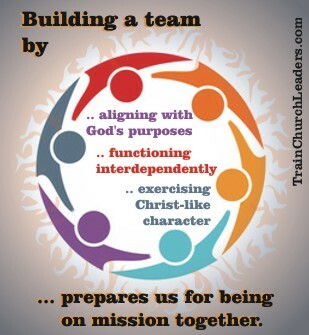 We’ve already noted, from the first two verses, that team building takes alignment with God’s purposes. Unity must be based on who we are and what with have in the Lord, not our own agendas. Personal agendas are born out of our own needs and interests. Consequently, team members must look beyond themselves to the needs and interests of each other, suggesting interdependence, which we see in verses 3-4. We need each other to be most effective. It’s not about how much “I” accomplish but how God uses “us” to do His work — interdependence, not independence. needing to do things your way — That’s selfish ambition. needing to get the credit — That’s vain conceit. needing to first think about how something affects you — That’s looking out for your own interests. wanting to be a servant — That’s humility. wanting to help others succeed — That’s valuing others above yourselves. wanting to consider how something affects others — That’s looking out for the interests of others. These phrases denote a mutual, reciprocal work on the part of believers one toward the other — functioning interdependently. Philippians 2 isn’t about one person, perhaps you as the leader, always keeping peace and progressing by caving in to the demands or agendas of others. It isn’t about someone becoming a doormat, being walked on by others. Rather, each and every one looks out for the interests of others. We value one another. We’re all in it together looking out for the good of the whole. Until you get to that point as a group, where you’re functioning interdependently, you haven’t built a team. This entry was posted in Team Building . Amen. I need to learn. Thanks you for your support. You are welcome. I pray this site continues to be helpful to you.